Need to use up a bunch of spinach? 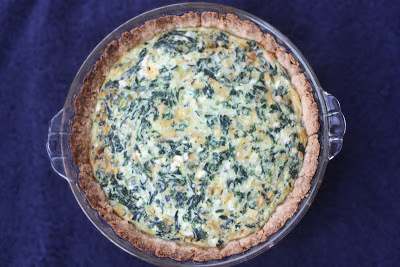 This fresh spinach quiche recipe is the perfect solution! It’s packed with three kinds of cheese – you won’t even notice how many greens you’re sneaking in! 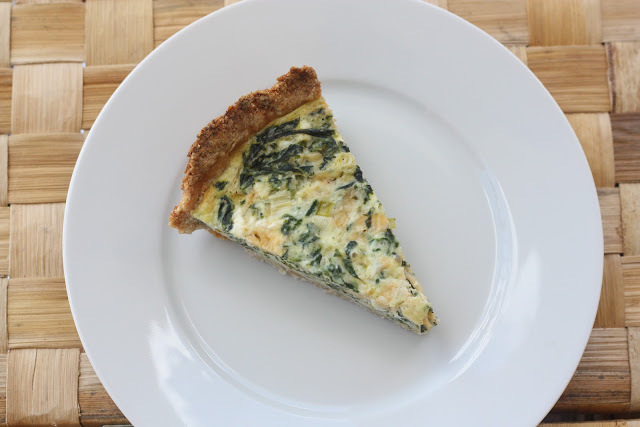 This fresh spinach quiche recipe was probably the very first vegetarian recipe that made its way into my regular rotation. I first made it about four years ago on a whim and I’ve continued to go back to it again and again. I used to think I didn’t like quiche, spinach quiche or any quiche, very much, but I’ve realized that I just don’t like quiche recipes that are mostly egg. I much prefer a recipe with 2-3 eggs. This spinach quiche has three different kinds of cheese – cream cheese, cheddar and parmesan. Basically there is no better way to use up a bunch of fresh spinach. Our CSA has been going crazy with spinach all summer long, so I’ve been making this fresh spinach quiche over and over again. It’s amazing warm from the oven, but it’s also fantastic as leftovers. And what more can you ask from a dish than that? Wash and chop the spinach, removing tough stems. Sautee in a pan over medium heat for about three minutes, or until spinach is wilted. Squeeze as much water out as possible (I put it in a colander and press it with a spatula). Be honest, you didn't let the cream cheese soften first. No worries, just microwave it for about 15-20 seconds. Beat it with the half and half and eggs until smooth-ish then mix in remaining ingredients, including drained spinach. Pour mixture into prepared crust. Bake until filling is set, 25-30 minutes. I'll have to try that pie crust as I lost my rolling pin (I have no idea how that happened) and am currently rolling out crusts with a kids-sized rolling pin from one of those toy kits. A no-roll crust sounds pretty good right about now! This looks and sounds fantastic! I love that it calls for fresh spinach, too. I don't know what it is about frozen spinach, but I am just not a fan. Vegetarian recipe! Onto it in a flash, until I read the ingredients — do you think it'll still be as good without the 3 cheeses, eggs, and half and half? (sad face). I made both the crust and the quiche for dinner tonight and it was hand down the best quiche I have ever had!